The city of Krakow has recognized Steven Spielberg for his efforts to preserve parts of the former ghetto where he filmed much of his Oscar-winning "Schindler's List." 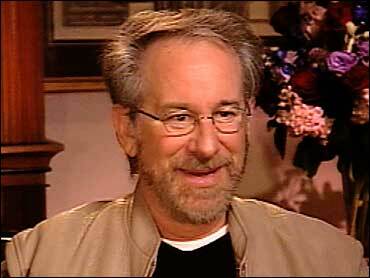 Spielberg was named a prestigious "Patron of Culture" for 2004 in a ceremony late Tuesday, Krakow spokesman Filip Szatanik said. The city cited the director's donation of $40,000 to preserve the former Pod Orlem pharmacy, whose owner risked his life to help Jews of the ghetto. "We are trying now to revitalize old Jewish districts in Krakow where people lived before the war," Szatanik said, adding that the award was one of the most important that the city bestows. "This support from Mr. Spielberg will help us to do this better." The pharmacy owner, Tadeusz Pankiewicz, was the only non-Jew who remained in the ghetto during the entire Nazi occupation. He provided food and medicine to the Jewish population and helped some residents escape. Pankiewicz described the experience in his book, "The Pharmacy in the Krakow Ghetto." The city will send Spielberg the award — a small bronze statue representing Stanczyk, a 16th-century court jester who served as adviser to Poland's King Zygmunt III. Director Roman Polanski, who is a survivor of Krakow's ghetto, also has donated to the preservation of the pharmacy, which was converted into a museum in 1983. Krakow is helping to build a museum in the factory where Oskar Schindler — the subject of Spielberg's 1993 film — shielded more than a thousand Jews during the Nazi Holocaust.